If you have never been to a faerie gathering before you may be wondering just what exactly happens. Each gathering is unique and a creation of the individuals that are there and so the particular activities and experiences can vary from one gathering to the next. Queer Space – a gathering is a place where people of differing ages, races, body sizes and shapes, sexualities and asexualities, genders and non-genders, magical, spiritual and religious beliefs all come together. This fluidity and diversity can be liberating as it allows you to be the “true you” but can also seem strange and intimidating to some that have never been in this sort of space before. If you are new to faeries/queer/lgbt groups you might want to have a chat with one of the organisers first to really get a feel for if this is for you. Of course, if your heart is crying yes, yes, yes then listen to that! Co-creation – radical faeries have a great phrase of “if you see something that needs doing, best way is to do it”! Although there are always a team of people helping bring the gathering to fruition beforehand, each event happens because of the people that come to it. Everyone chips in to help in whatever way they can through helping to prepare meals, washing dishes, setting tables, sweeping up, chopping wood, creating workshops, holding heart circles, taking part in entertaining others, participating and supporting activities etc. There is no obligation for you to do any particular thing, but participation and involvement are a gathering in many ways. 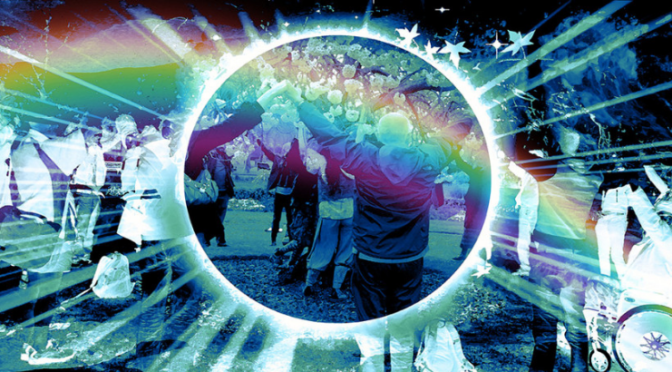 Workshops & activities – people bring an amazing mix that can include rituals, dancing, drumming, theatricality, music, art, sexuality, sensuality, card games, rumpuses, fancy dress and dresses, silence, solitude, serenity, chaos, noise, drama and more! Remember, if you bring it, it will (most likely) happen! Conduct – a gathering aims to be an inclusive space and also a safe and supporting space. Occasionally those three don’t quite fit together and in those rare times, the organisers may highlight to individuals/groups how their behaviour could be causing some conflict and ultimately may ask someone to leave if that is felt it protects the overall gathering. Support – a gathering is not a group counselling session. The wide mix of people and activities means you may decide to try new things or take risks/push boundaries. As a participant you should assume responsibility for your own personal, emotional, physical and sexual safety and should exercise due care and understand and accept this. That said, there are heart circles, understanding fairies, hugs and waiting organisers around to help you in many ways with support and love.